If you haven’t seen Three Billboards Outside Ebbing, Missouri run to the theater and watch this amazing flick. 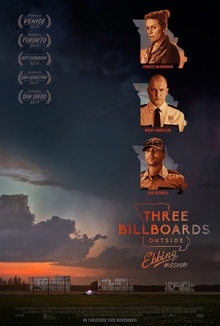 Written, produced, and directed by Martin McDonagh (In Bruges, Seven Psychopaths), Three Billboards Outside Ebbing, Missouri stars Frances McDormand as Mildred Hayes, a weathered, middle-aged divorced mother of two, Woody Harrelson as Chief (of Police) Willoughby, Sam Rockwell as the dimwitted, racist police officer, James Dixon (pronounced “DickSon” throughout the film) and Peter Dinklage (of Game of Thrones fame) as James, the local pool shark and car salesman. Set in the fictional town of Ebbing, Missouri, the movie is the story of a grieving mother (Mildred Hayes) who lost her 20-year old daughter and decides to rent three billboards on the outskirts of town to call out the police department for not finding her daughter’s killer. Chief Willoughby takes offense to the billboards, as does his deputies (and in particular Officer Dixon) along with the residents of the town, but he also understands Mildred’s frustration with the lack of leads in the brutal slaying of the young woman seven months prior. Nominated for numerous awards (and winning the Audience Award at the San Sebastian International Film Festival), Three Billboards Outside Ebbing, Missouri is a dark comedy that pokes fun at racism, ineptitude, small town life, the male mid-life crisis, and homophobia while telling a story that watchers never want to end. But what the movie really excels at is showing the spectrum of good and evil in characters that initially appear to be one or the other. Most audience members will think that Jason Dixon (you may remember him as the murderer in the 1999 film, The Green Mile) is a despicable character and in many ways he is but Dixon is also a man who wants to do better (if only he could control himself). Reminiscent of police officer John Ryan (played by Matt Dillon in the Oscar-winning 2004 film Crash) who was also both evil and good, Dixon is a product of his genes and his environment…and McDonagh excels at showing us the conflicting aspects of human behavior. Although many people think the film is based on a true story, Three Billboards Outside Ebbing, Missouri is a fictional tale so cleverly told that watchers keep hoping the film credits won’t come up and that the story keeps going. It’s that great. Don’t miss it.